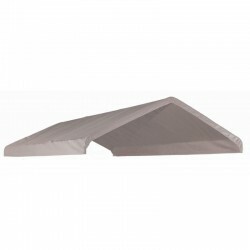 Shop our fabric pop up canopies from top brand name ShelterLogic. Pop up canopies offer you a quick instant shaded area for events, picnics, camping and any other outdoor spot you want a relaxing covered area for shade or rain. Free Shipping on all orders! ShelterLogic anchor bags are a portable, easy-to-use temporary anchoring solution for use with Pop-up canopies on hard or soft surfaces. 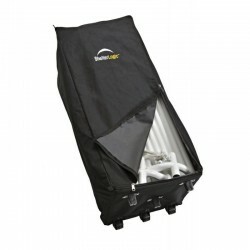 Ready to go rolling storage bag built with quality materials, is a great storage solution for canopies and accessories. 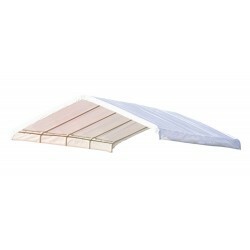 Perfect for refurbishing worn out or damaged canopy covers. 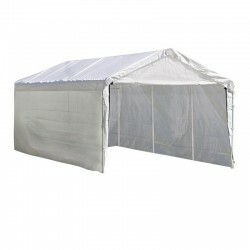 The ShelterLogic Max AP 10 ft. x 20 ft. Canopy Enclosure Kit delivers more options, and more versatility to your canopy. Quickly convert your 10 ft. x 20 ft. , 2 in. diameter fixed leg canopy to an enclosed shelter in minutes. 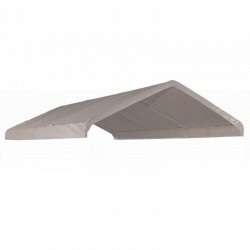 The ShelterLogic Max AP 10x20 Canopy Enclosure Kit delivers more options, and more versatility to your canopy. Quickly convert your 10 x 20, 1 3/8 in. diameter fixed leg canopy to an enclosed shelter in minutes. Attaches to the frame quickly and easily with bungee fasteners. The ShelterLogic 12 ft. x 20 ft. Super Max Canopy Enclosure Kit delivers more options, and more versatility to your canopy. 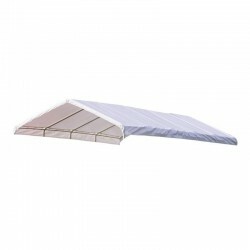 Quickly convert your 12 ft. x 20 ft. , 2 in. diameter fixed leg canopy to an enclosed shelter in minutes. 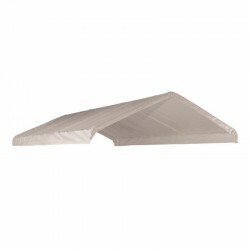 The ShelterLogic Max AP Canopy ClearView Enclosure Kit lets you expand the use of your canopy. 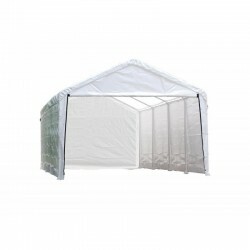 Quickly convert your 10x20 Max AP Canopy to an enclosed shelter with windows in minutes. 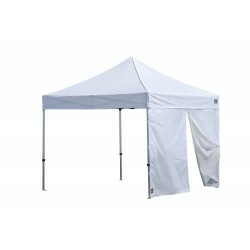 Display your goods or protect your guests with our best built Sport Pop-Up in White. Lighter, easier to carry 8x8 Slant Leg Sport is our most compact Open Top Frame Pop-Up. It delivers quality features, heavy duty frame and cover design. 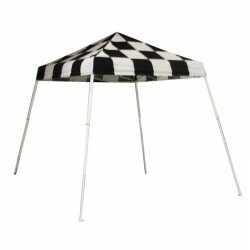 The perfect shade solution for sporting events, backyard events, tailgating, camping or commercial use. The ShelterLogic purple 8ft. x 8ft. slant leg Sport Pop-up features an open top combined with sturdy construction and stylish design. 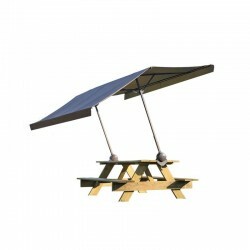 Ideal for commercial use or for sports, backyard, tailgating, or camping. It delivers quality features, heavy duty frame and cover design. 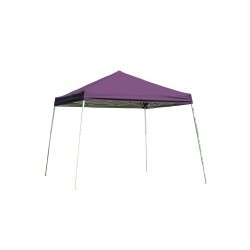 The perfect shade solution for sporting events, backyard events, tailgating, camping or commercial use. 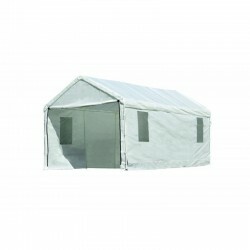 Display your goods or protect your guests with our best built Sport Pop-Up. Lighter, easier to carry 8 ft. x 8 ft. Slant Leg Sport is our most compact Open Top Frame Pop-Up. 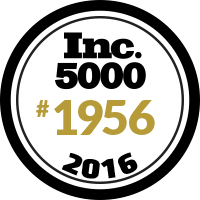 It delivers quality features, heavy duty frame and cover design. 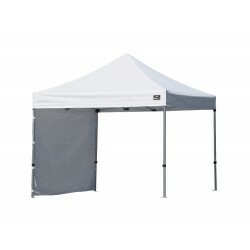 The perfect shade solution for sporting events, backyard events, tailgating, camping or commercial use. 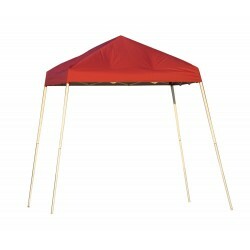 Display your goods or protect your guests with our best built Sport Pop-Up in Red. Lighter, easier to carry 8x8 Slant Leg Sport is our most compact Open Top Frame Pop-Up. It delivers quality features, heavy duty frame and cover design. 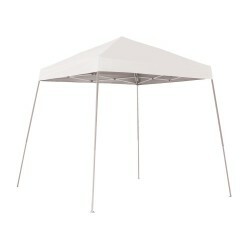 The perfect shade solution for sporting events, backyard events, tailgating, camping or commercial use. The ShelterLogic Green 8x8 Sport Pop-Up comes fully assembled for ready to go anytime, anywhere shade and protection. Quick portable shade as easy as 1,2,3. With 2 people simply remove the frame from the bag, pull the legs out, attach cover and enjoy. The ShelterLogic 8x8 Sport Pop-Up comes fully assembled for ready to go anytime, anywhere shade and protection. Quick portable shade as easy as 1,2,3. With 2 people simply remove the frame from the bag, pull the legs out, attach cover and enjoy. 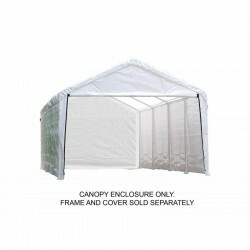 The ShelterLogic 12 ft. x 30 ft. Super Max Canopy Enclosure kit allows you to expand Your canopy options. Quickly convert your Super Max 12x30 canopy into a functional, low cost, enclosed seasonal shelter in minutes. 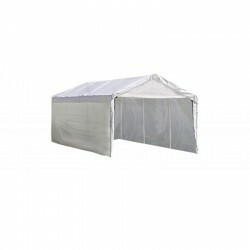 The ShelterLogic 12ft x 26 ft Super Max Canopy Enclosure kit allows you to expand Your canopy options. Quickly convert your Super Max 12x26 canopy into a functional, low cost, enclosed seasonal shelter in minutes. The cover shifts left to right, adjusts vertically up and down, and tilts to 20 degrees in either direction. It is the ideal outdoor, customizable portable shade solution. © 2006 - 2019 ShedsDirect.com All Rights Reserved.